From her introduction as Stannis' resident priestess, witch, and extramarital lover, Melisandre has always been Game of Thrones' most fascinating wild card. Her powers are enormously flexible, ranging from the birthing of semi-sentient smoke golems to the resurrection of multiply-stabbed corpses. Moreover, they are seemingly inexhaustible — she is able to do all that she does while, as we learned in season 6, maintaining a young and beautiful form that flawlessly obscures the reality of her ancient body. She is perhaps one of the most powerful characters in the show's entire cast, and as we enter the final season and all the battles, subterfuge, and magical mayhem that comes with it, she remains a fascinating enigma. Could she turn the tide of the battle against an endless winter? Could she put someone on the throne through belief in the Lord of Light alone? Will her apparently endless life truly, as she seems to believe, come to an end in a land so far from her origins? All this and more points to one tantalizing conclusion: Melisandre is one of the important characters in Westeros. We're here to explain why. Melisandre is many things: shadow-binder, blood witch, devoted priestess. But perhaps her most shocking power is that of casting glamours. As audiences discovered in the season six premiere "The Red Woman," Melisandre isn't the comely young woman she pretends to be. She is, in fact, a withered crone — old enough to walk with a hunched and tentative gait and a dramatically thinned head of iron-gray hair. It seems (though this hadn't been made explicitly clear) that her necklace, and particularly the large red stone at the center of it, contains and channels her power. When she removes it, her appearance shifts from that of thriving youth, health, and beauty to someone who is staving off death by supernatural means. 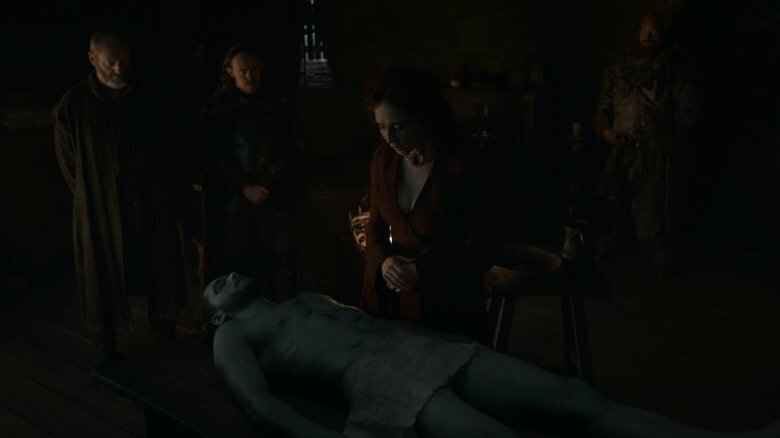 Though we've seen appearance-changing magic before in the world of Game of Thrones — recall the Faceless Men Arya trained with, and the magical labyrinth Daenerys fought through in the House of the Undying — Melisandre's personal control over her form surpasses anything we've seen before on an individual level. Unlike the Faceless Men, she does not appear to need body parts from another, nor the power of the dragons Pyat Pree sought to use for his own means. Melisandre isn't even forced into revealing her true form: she does so alone, out of despondency. This level of self-sustained power is unique among the show's vast cast of magic-users, and could be put to innumerable uses in the season to come. Religion has motivated everything from the greatest, most transcendent works of art in any culture to some of the most depraved acts of mass cruelty the world has ever seen. There is little a true and ardent believer might not do for the love of a being they believe to be almighty. Melisandre doesn't just believe the Lord of Light to be almighty. She believes he makes her something pretty close to almighty as well, and that he has very particular plans for the world that she is duty-bound to carry out. She is eager to do so, as we have seen, by any means necessary. But the thing is, those means work. Though the Lord of Light's true nature and intentions remain largely opaque to Melisandre and the audience, he does appear to have some level of power that is, for lack of a better word, real. Melisandre really can create shadow creatures with missions they are able to carry out. She is able to glimpse some degree of future events, even if she does not always interpret them correctly. The jury is out as to whether or not this was coincidental, but she killed three leeches in place of Robb Stark, Joffrey Baratheon, and Balon Greyjoy, and, well, they all ended up dead. Melisandre is a fanatic, with a fanatic's unbreakable devotion — but she might not actually be wrong. The world of Game of Thrones is far vaster than the show will ever be able to explore in full. There's Westeros, where most of our journey takes place, and Essos, where certain main characters like Arya spend time. Then there are places beyond that we've only heard hints of. Each of these lands has their owns brand of magic and mischief, from the horse-centric nomadism of the Dothraki to the dimension-bending sorcery of the Qartheen warlocks. Much of it is implied to be hearsay, however — the kind of chattering of an age with no mass travel and a lot of time to kill. This is not the case with Asshai, the land Melisandre is from. Situated in the farthest corner of Essos, Asshai is said to be near what are known as the Shadow Lands, where the Dothraki believe "ghost grass" grows, which will one day devour the world. Shadowbinding is said to be uniquely Asshai'i, along with dark magic of an even more deeply black hue. Even the books don't elaborate much further, describing a place mostly known for its utter mystery and general aura of menace. No one knows what Meslidanre might have learned from such a place, beyond the shadowbinding she used to murder Renly Baratheon. But, as we saw before our very eyes, shadowbinding is very much real. What else might lie in her bag of Asshai'i tricks? Perhaps the final season will reveal just that. We know the Lord of Light is powerful. We know that he is able to inspire intense belief in his followers, and that he rewards them with actual, measurable power: the kind that kills kings, peers into the future, and can tell the difference between royal and mundane blood. That's really enough on its own, but here's the kicker: the Lord of Light is global. Though the Westerosi Faith of the Seven seems omnipresent in the series, it's really only because the show is largely confined to Westeros. The Lord of Light, however, spans continents, beyond what we are ever likely to see. Melisandre herself, of course, is from an obscure corner of Essos. Then there is Thoros of Myr, who spent most of his life living in Westeros, using his power to bring back Beric Dondarrion. Now that Tyrion's traipsing across the world, we've caught glimpses of Lord of Light followers leading fervent rallies in the streets, attracting hundreds of adherents, and season 6 saw the addition of high priestess Kinvara to Daenerys' court. One thing is clear: the Lord of Light is a phenomenon far larger than any other faith we've seen, and as opposed to the Seven, it gets results. Melisandre doesn't just have the backing of her Lord — she has a veritable army of similarly-inclined believers. 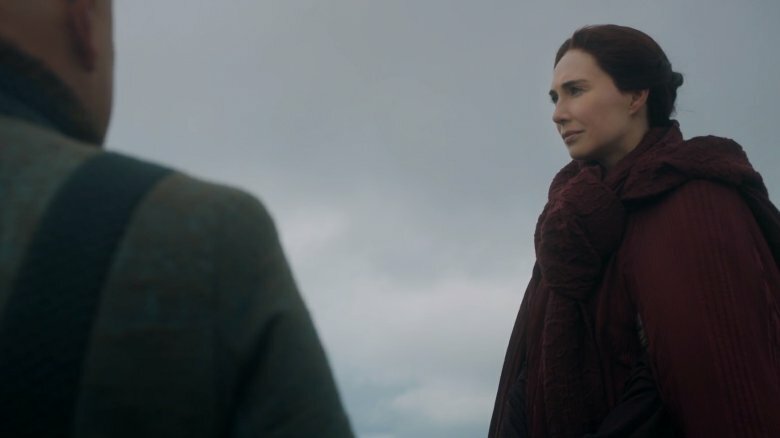 Melisandre has filled many roles over the course of Game of Thrones, from Stannis' priestess to Jon Snow's unlikely guide back to the land of the living. Her life has taken her far and wide, across more of the world than any other character, and it's lasted so incredibly long that there is much we will never know about her. Given the breadth and depth of her journey thus far and just how flexible her powers have proven to be, there is no telling how she will matter in the battles to come. We do know one thing, however. As she told Varys in the season 7 episode "The Queen's Justice," she knows that she is fated to die in Westeros. She says this as she is about to embark on voyage back to Essos, from whence she came so many years ago. We don't know her intentions in returning. She could be plotting with Kinvara and other red priests and priestesses to shore up support for Daenerys. She could be plying her trade among commoners, as she declares her time "whispering in the ears of kings" to be over. Maybe she's just looking to take a break after what she now reflects on to be a string of mistakes. Only one thing is certain: she'll be back. There's no telling when, where, or why, and she will die before she travels again. Melisandre has been defined from her introduction by her atypical level of insight into the fates of others. Her gazes into the fire have taken up an impressive percentage of her screen time. Though her visions are not always reliable and remain subject to fallible interpretation, she's been right often enough to make them worth paying attention to. She understands that the war against the Walkers is the one worth fighting. She understands that bringing together Jon and Daenerys — "ice and fire," as she put it — was crucial and worth her many machinations. She knows her own fate, even if only as loosely defined as "going to die, some day, some time, in Westeros." But she doesn't just know her own fate. 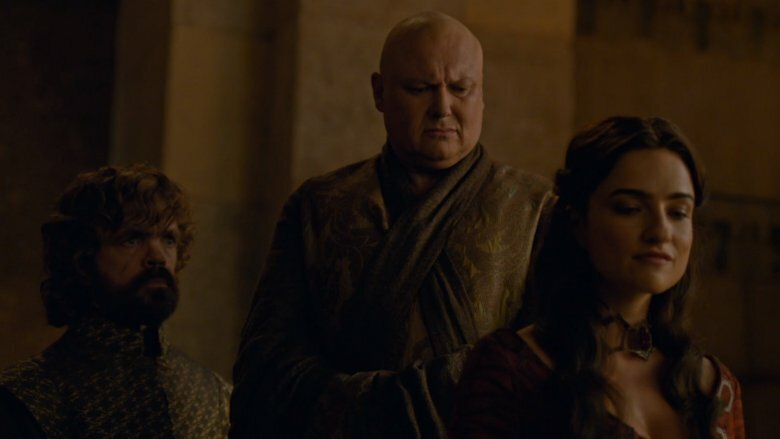 As she follows up, she knows Varys' — he is, according to her, also fated to die in Westeros. This does not come after a lengthy fire-gazing session, and she used none of his blood in a complicated rite. She just knows. 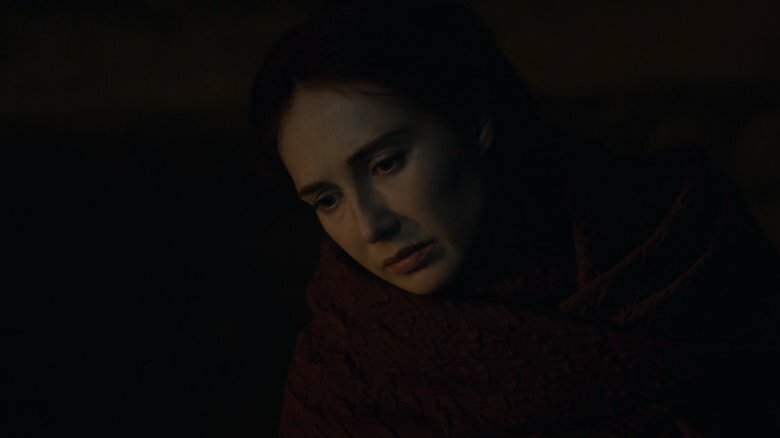 Melisandre appears to have some level of foreknowledge of deaths royal and lowly, common and elevated, to a degree that is utterly unique and that she only reveals rarely. Who else does she know about? Why does she know about these fates at all? And what does her Lord compel her to do about it, as winter breathes down the world's neck? We're not quite sure how old Melisandre is. When asked for specifics by Entertainment Weekly, director Jeremy Podeswa revealed that landing on an exact age is not a priority of the show. "The idea is there's an indefinite indeterminate quality that she could be ancient," he remarked. "We were limited… what does a 400-year-old person look like?" What is clear is that she is enormously, legendarily old. While her ability to disguise this fact is incredible in and of itself, there is also the question of how she got to be that old in the first place. 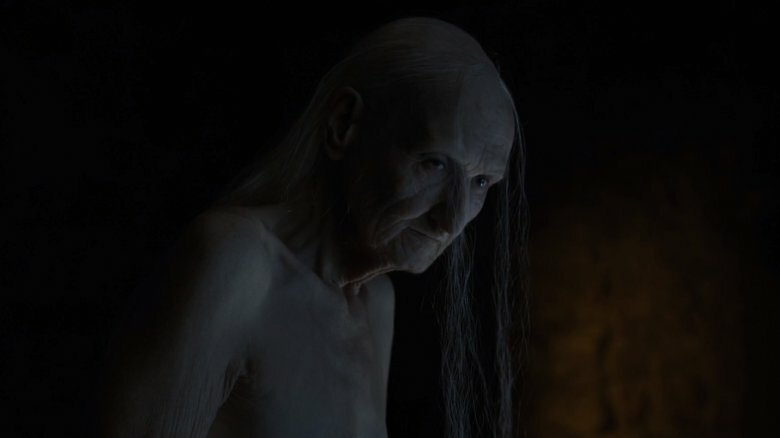 There is no one of comparable age in Game of Thrones — really, in a world as cruel and indifferent as this one can tend to be, it's remarkable anyone gets to senior discount age at all. 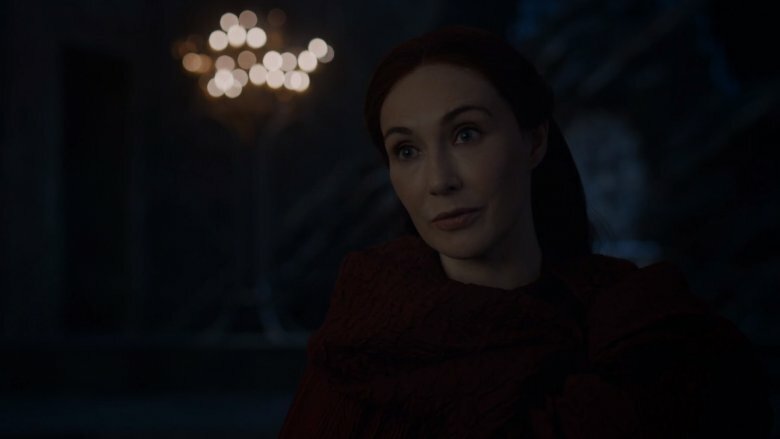 Melisandre stands alone, and this suggests two fascinating possibilities: that she, by virtue of living so long, has accrued more knowledge than anyone else has, and that she knows how to stave off death seemingly indefinitely. How might she use this to help our heroes? She's already brought Jon Snow back once. Perhaps she might work a little magic to help him stick around as long as she has? Maybe she's got a personal recollection or two about Daenerys' distant relatives to share? Either way, she has an edge on everyone else, and there's no telling how she might use it. Like all of Melisandre's powers, her control over blood magic remains murky. Can she work anything special with blood that does not come from the descendent of a king? Was she really responsible for Robb, Balon, and Joffrey's deaths? What about her sacrifice of Shireen? 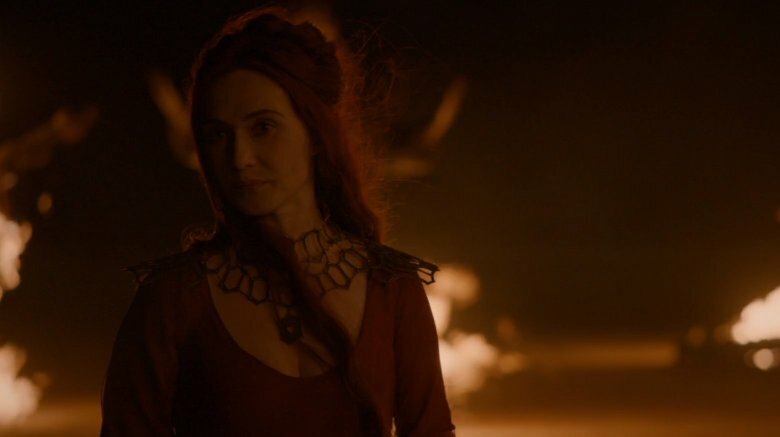 If Stannis really had been the endpoint of the many prophecies she believes she is god-bound to fulfill, would Melisandre's murder have accomplished something more? Even though Stannis' forces were conquered, did Shireen's death bring about the sought-after thaw that preceded that defeat? The limits of blood magic remain murky, but one thing doesn't: the fact that blood magic exists, and Melisandre wields it. We all saw her give birth to a smoke monster and we all saw it stab Renly with a very real, very lethal blade. One question presents itself, then, on the eve of Game of Thrones' final season and the reveal of Jon Snow's true parentage: what might she do at the moment the stakes are highest, with the blood of the rightful king of Westeros? She supports Jon Snow, and we all know there is nothing Melisandre will not do for the claimant she supports. The possibilities are potent and seemingly unbound by the restrictions other characters have placed upon them. She's used a king's blood before — but not the king of Westeros, the King in the North, and the lover of the Queen all in one. 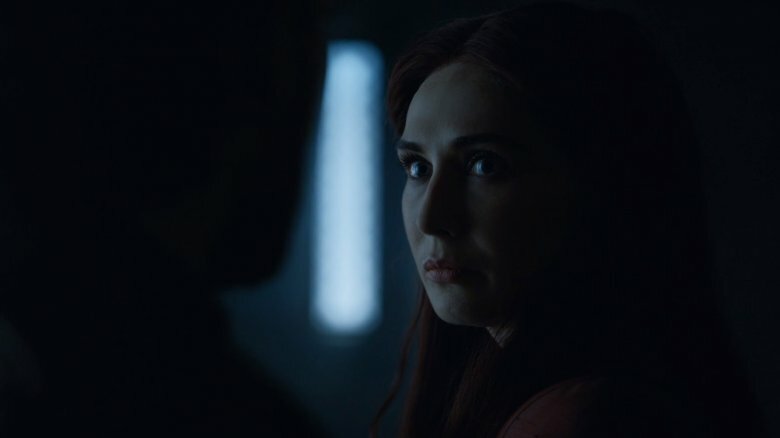 While many of the character interactions and details that make Melisandre someone to watch are immediately understood as important — smoke demon births, child sacrifice, the seduction of kings — some are rather more understated. When she mentions that she is incapable of feeling the cold to Jon Snow, for example, it is an offhand comment on the Wall, and could even be taken as metaphorical. She worships a fire god and feels that he is always with her, thus keeping the cold — and all the death and desolation is symbolizes — at bay. She is never alone with the Lord of Light, and thus she is always warm. But this is a woman who can literally work magic and, on occasion, conquer death itself. So let's take it literally, in the context of a fight against what amounts to sentient winter. Does this mean that she could prove resistant to the particular magic of the Walkers? Could she stave off the hordes of wights somehow, with her general aura of warmth and that of her fire god's powers? And, perhaps most importantly, are these powers she could bestow on somebody else? She might have meant the comment as entirely literal, but given the extent of her powers, it seems unlikely. 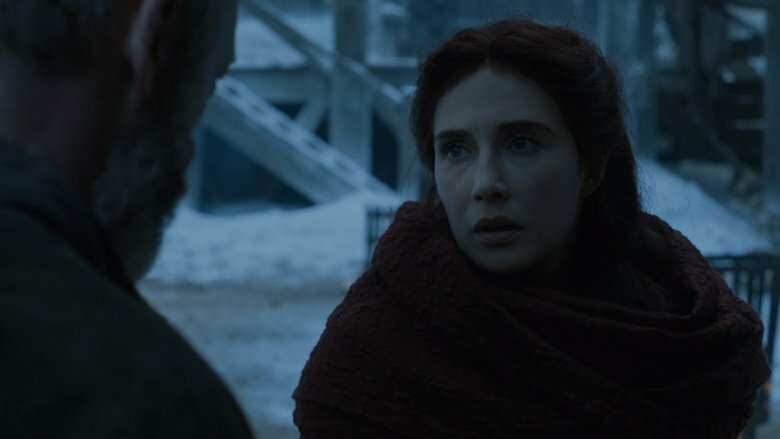 Melisandre doesn't feel the cold, and the cold is the greatest threat of all in Game of Thrones' final conflict. Perhaps Melisandre's most astonishing feat was resurrecting Jon Snow from the dead. Despite the fact that she doubted her ability to do so, despite the fact that (unlike Thoros of Myr and his repeated raising of Beric Dondarrion) she had never done so before, despite the fact that it seemed to take a bit longer than she anticipated, and despite the fact that (unlike Beric) Jon had been dead for a while… she did it. 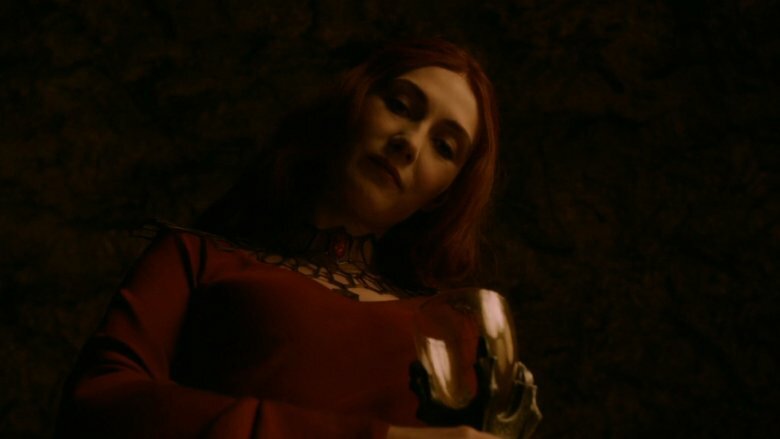 In the hands of someone so close to characters as vital to the plan as Jon, Daenerys, and Tyrion, there's no telling what Melisandre could do with this power in the future. She doesn't seem likely to use it as freely as Thoros — and perhaps she isn't even able to — but after Jon's eleventh-hour comeback, she knows it can be done. Who else might she save? How could this life-centric power interact with the White Walker's death-centric powers? Though there is much we do not know about the Lord of Light and the gifts he bestows upon his most loyal followers, he and his associated faith do seem diametrically opposed to the shivering doom that now threatens the world of Westeros. 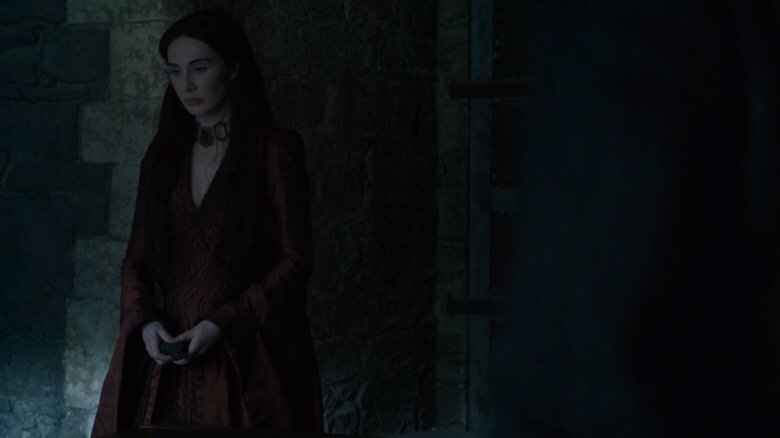 Melisandre has proven that she can channel this power in this most direct sense: she can reverse death with nothing but her prayers and her hands. There's no telling how she might use this — and no telling how it might affect the final season of Game of Thrones.